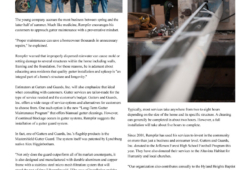 November 2013 • Gutters & Guards, Inc.Gutters & Guards, Inc.
We recently had a question come in about hanging Christmas lights on Gutter Guards. It was a great question to be asked because we only hang lights once a year and they’re typically hung from the gutters. 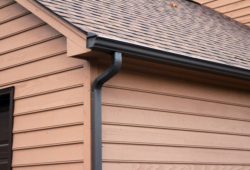 Although if you cover it up with a gutter guard what are you to do? source If you are planning on getting new gutters installed then plan ahead and tell your installer that you plan to hang Christmas lights on your gutters. There is a specific clip that Mastershield suggests that will not void the warranty or damage your product ( if installed correctly). 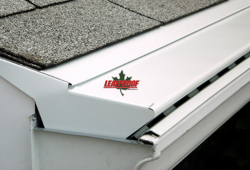 If you have existing, gutter guards and cannot get any clip to work, do NOT tamper with it because you can potentially void your warranty or worse break the gutter guards. If you have the large screen mesh holes then you don’t have to large of a problem because they make screen mesh hooks that fit right into the hole of the guard. Here is a brief video that demonstrates how it works. There are alternatives to hanging lights on your gutters. The first alternative is to hang them from your roof shingles. 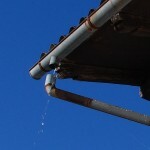 This has the potential to get wet easier and might make a mess of your shingles or roof depending on how you attach it. 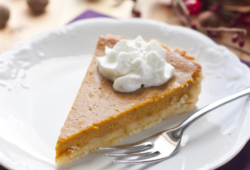 Here is a way that we suggest you do this that will be best not to mess it up. To do this you will need to buy shingle clips that attach to the shingle. They are easy to find online or even in the store, just be sure to find ones that will not damage your shingles and that will not fall off easily. The other alternative part is to hang it from your fascia board. This is a little less higher and to be honest a lot safer. You might think that this is too low but be honest with yourself, lights are to be enjoyed at night and how can you really tell where they are truly hanging from in the dark. Here is a way that we think is the best to hang them from your fascia board without messing up anything important to your house’s safety from the weather. You can buy brass cup hooks and spray paint them to blend in with your fascia board. Install the brass cup hooks under the fascia board by drilling small holes for them to fit. Voila, you have an easier accessible place to hang your Christmas lights. It’s not be a total pain in the neck to do once a year. 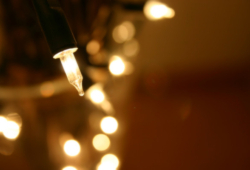 A few other tips that a crucial when preparing to hang Christmas lights. 1. Always untangle and check the lights on the strand. This is so you won’t have to untangle them while on your ladder or so they won’t short and become a potential hazard for a fire to start. 2. It’s best to not do this alone if possible. Having someone help you by handing you supplies will not only make it go by a little faster but also they will be there for your safety. 3. Ladder safety is very important. Make sure that the ground is even, step on the pail shelf or reach further than you can, and that someone holds the ladder for you. 38% of ladder falls happen while hanging Christmas lights. ( source ) 4. Use a timer. This can save you from having a super expensive electric bill or being the Clark Griswald of the neighborhood. (You probably shouldn’t hang your lights like him either, very dangerous.) 5. Don’t over do it. Remember that you do have an electric bill and that could ruin your holiday spirit. Let your home glow this holiday and be safe about it so you can enjoy it. 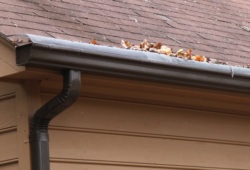 Do I need To Replace Gutters Or Repair Them? Comments Off on Do I need To Replace Gutters Or Repair Them? 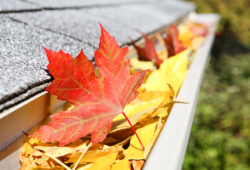 Comments Off on Why Do Gutters Clog?